Put your hands together for Michelle Buteau, and special guests Aparna Nancherla and Sam Jay! The comedian and unofficial “3rd Dope Queen” has a new podcast from WNYC Studios — and you can see it taped live. In the great tradition of late night, but with Michelle’s signature comedy and warmth, Late Night Whenever features celebrity interviews, hilarious monologues and music from Michelle’s BFF Rob Lewis, producer to stars like Christina Aguilera and Patti LaBelle. Get ready for the no-budget Oprah experience as Michelle turns the mic on her audience. She’ll keep you on your toes like Misty Copeland at the Met! 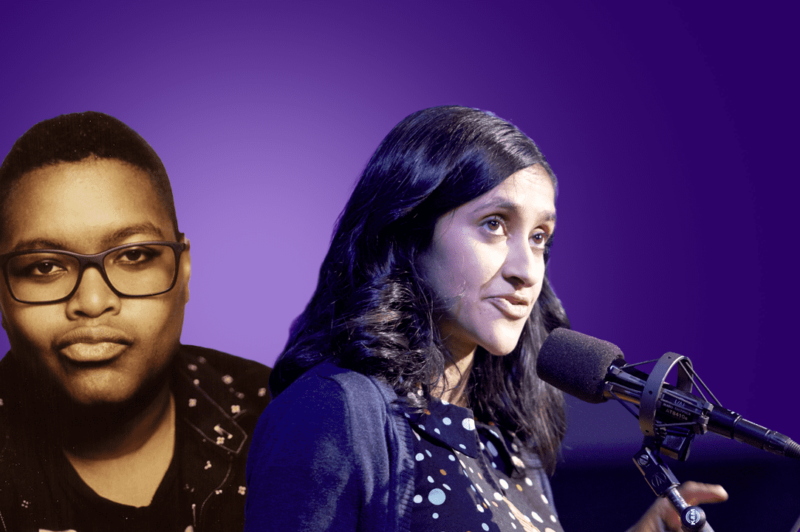 Aparna Nancherla started out doing comedy in her hometown of Washington D.C. and now resides in New York City. 2016’s Elle’s Women in Comedy Issue featured her as one of the most exciting new voices to hit the comedy scene. She is a series regular in the debut season of Comedy Central’s Corporate and has reprised her role in season 2 of HBO’s CRASHING. Sam Jay is a writer on Saturday Night Live and stand-up comedian. In addition to the premier of her stand up special in 2017, she was also the host of Ricking Morty, the Rick and Morty post show on Adult Swim. She’s made appearances on Late Night with Jimmy Kimmel, Comedy Central’s White Flight, The Meltdown with Jonah & Kumail, MTV’s Safeword, and Viceland’s Party Legends. You know Michelle’s work from 2 Dope Queens, along with Broad City, Key and Peele, The Eric Andre Show, and as a host on VH1’s Big Morning Buzz. Born in New Jersey to Caribbean parents, the comedian/actress brings her unique perspective and big personality to stage and screen. As a comedian, she has toured the country performing at colleges, clubs, and festivals. Her half-hour special premiered on Comedy Central in September, and Comedy Central Records concurrently released her album, Shut Up!, which is now available on iTunes. She starred in the Seth Rogen and Evan Goldberg directed/produced pilot Singularity. She will be a featured comedian on the 2 Dope Queens special for HBO.